“We have grown the undergraduate population almost 25 percent, and done so while raising the standards for admission,” notes Ilene Busch-Vishniac, who congratulates a graduate of the Whiting School of Engineering. Webster’s defines legacy as “something handed down from one who has gone before.” In the academic setting, legacies are part of the rich tradition. They define the institution’s history, ensure its continuity, and guide it through turbulent times such as today. The legacies of the Whiting School of Engineering are embodied in its people—past and present. In many corporations, a transition of leadership signals a change in direction, often with a major shakeup of management and a change in corporate structure. In academia, by contrast, our structures are resilient, surviving generations of leaders, and our management is also our product in a sense—our faculty—so shakeups are rare. I came to Hopkins nearly five years ago and found myself standing on the shoulders of giants: deans of the caliber of “Rob” Roy ’28, Bill Kouwenhouven, John Whitehead, David VandeLinde, Don Giddens, and Roger Westgate aren’t easy to find. Each of these deans understood the resilience of the School and managed to slowly turn the course of Hopkins to one that appreciates the role of an engineering and technology school in driving the institution forward. 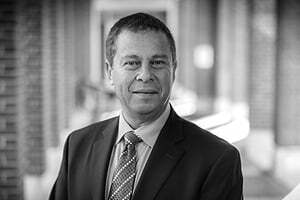 What I have accom- plished in my tenure as dean would never have been possible without the extraordinary accomplishments of my predecessors and the support of the School’s faculty and friends. Let me review some of what we have achieved in the last five years—in other words, what I hope will be my legacy. First, we have grown the undergraduate population almost 25 percent, and done so while raising the standards for admission. There is a perverse rule in admissions that as you make it harder to get into a program, you often find yourself getting more applicants, which just feeds the ability to raise the standards. We are still on the climbing part of this curve. Second, we have increased the amount of our externally funded research by over 65 percent in the same time that we have only grown our faculty by a few percentage points. This speaks to an enormous increase in faculty productivity, which largely comes from years of hiring very talented people and providing them with the resources needed to succeed—one of the key legacies of my predecessors. As a result of our research gains, our graduate program rankings have improved or main- tained their position in every department. We’ve also grown our real estate in order to support our teaching and research mission: We have built Clark Hall, renovated Maryland and Krieger halls, taken hold of part of the Wyman Park Professional Building, added Hodson Hall to our classroom reservoir, renovated and moved into one of the former Stieff Silver buildings near the Homewood campus, and started the process of constructing a new computer science building (scheduled to be opened in 2006). At the same time, the campus has added buildings that support student life—the Bunting-Meyerhoff Interfaith and Community Service Center, the Mattin Center, and the Ralph S. O’Connor Recreation Center. We are now moving to turn Charles Village into more of a college town, with plans for a large residence hall/bookstore/expanded retail/parking complex at 33rd and Charles. Wow! No wonder I’m tired! When I review the last five years and look for a central theme that defines the progress we’ve made, I’d have to say it’s growth: growth of the undergraduate population, increases in research support, introduction of new programs such as the Environmental Engineering major and growth of space to house our core missions of teaching and research. Plus, we have expanded our outreach to the many communities Hopkins touches, such as our programs to provide research experience for science teachers in middle and high schools and our new support of international experiences for our students. Clearly, none of these gains would have been possible without another legacy—the strong commitment and support of alumni and friends for the future of the Whiting School. It is you who ensure that we continue, you who build our history, and you who educate and assist the School’s new leaders. I thank you from the bottom of my heart for your assistance these five years, and I rest comfortable in the knowledge that you will offer my successor the same steadfast support that I have enjoyed. 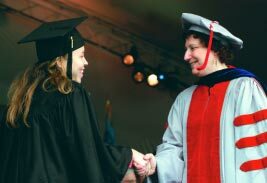 Dean Ilene Busch-Vishniac completed her five-year term as dean in June 2003. She remains at the Whiting School as a professor of Mechanical Engineering.